After years of work and billions of dollars of investment, Google recently announced that this year, 100 percent of its offices and data centers will be powered by buying wind and solar electricity. It’s a major feat for the search engine giant, which has led the way in buying renewable power. But what about all of the other companies out there that don’t have anywhere near Google’s balance sheet, environmental commitment or energy bills? For many corporations trying to buy clean energy, the process can be “brutal,” said Bryce Smith, founder and CEO of LevelTen Energy. “Only the largest corporate buyer can often participate and get a good deal,” he said. Why? The projects that big companies like Google buy power from are generally large, 100-megawatt-sized wind or solar projects that aren’t yet built. Google and its ilk make a commitment to buy all of the power from the farm, the wind developer gets a guaranteed customer, and the company gets a good deal on the price of electricity. Smaller companies can’t commit to buying such large amounts of power because they don’t need it. As a result, they can get boxed into buying electricity from smaller farms with higher prices. In addition, corporate buyers need to be well versed in how wholesale power markets work in order to determine if a clean energy deal is economically viable or not. If a company buys energy from a wind farm in a region where, for example, many new wind farms are getting built, the electricity price dynamics -- and value proposition -- could change dramatically. Rocky Mountain Institute calls this problem the “winner’s curse” -- where the price and the value of a renewable energy project don’t match, and the customer’s asset doesn’t deliver the expected return. To find a solution for these problems, Smith, a 20-year clean energy veteran, created LevelTen Energy last year. The company, which completed the Techstars accelerator, has built software and data tools that aggregate clean energy projects and sell them in a manner similar to how mutual funds are created and sold. 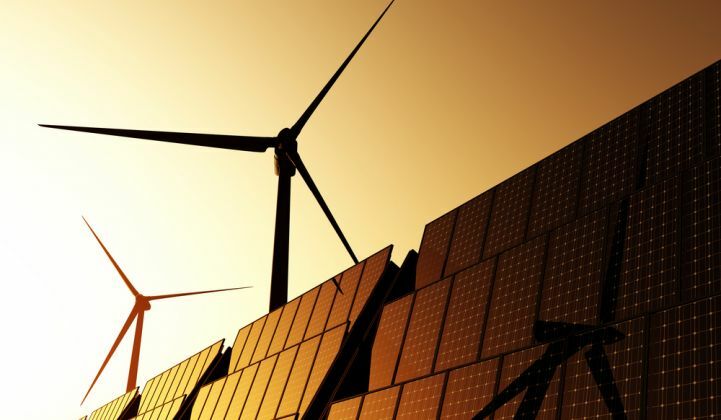 “In the same way that mutual funds changed equity investing for individuals, for companies and clean energy it makes sense to have a more diversified portfolio and spread the risk over eight to 10 projects,” said Smith. LevelTen Energy uses analytics and wholesale market expertise to try to get corporate buyers the best deals possible. On Monday, LevelTen Energy announced its first clean energy portfolio totaling 410 megawatts, which represents two wind and two solar projects in the Eastern U.S. territory of regional transmission organization PJM. Smith said the portfolio already has customers but declined to name who those customers are. In addition to the first deal, LevelTen Energy announced that it's closed a Series A round of funding of $6.8 million to expand its outreach to new customers. Investors include Prelude Ventures, Techstars Venture Capital Fund, Founders’ Co-Op, Wireframe Ventures, Element 8 Fund and Avista Development, a subsidiary of Avista Corp.
Smith, who previously co-founded utility clean power developer OneEnergy Renewables, said when he first joined Techstars he “felt like a fish out of water,” given his long history in the energy industry. However, the tech focus quickly emerged as a crucial part of building the product, attracting customers and bringing in employees. LevelTen Energy is riding the growing wave of clean energy procurements. There was 1.24 gigawatts' worth of corporate renewable energy procurements in the first half of this year, according to Rocky Mountain Institute, which has also built a service to help corporate buyers. Close to 100 companies have committed to go 100 percent renewable as part of the RE100 campaign. But it is readily apparent that the bulk of those ambitious companies are some of the largest tech firms and industrial giants in corporate America, with small and medium-sized companies tending to be more hesitant about making such a pledge. The proof of whether LevelTen Energy can help solve the growing pains of corporate clean energy buying will come down to if, and which, corporate customers sign up.